1. A man standing at a point P is watching the top of a tower, which makes an angle of elevation of 30 with the man's eye. The man walks some distance towards the tower to watch its top and the angle of the elevation becomes 60. 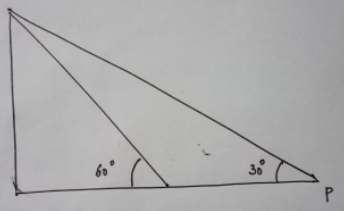 What is the distance between the base of the tower and the point P ? Let AB be the tree and AC be its shadow, So as per question, the shadow of a tree is √3 times the height of the tree. Lets assume h be the height of the tree. 5. 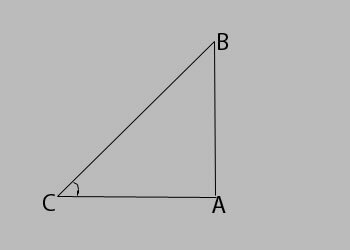 The base of a triangular field is three times its altitude. If the cost of cultivating the field at Rs. 24.68 per hectare be Rs. 333.18, find its base and height. A. Base = 100 m & Height = 200m. B. Base = 900 m & Height = 300m. C. Base = 1900 m & Height = 300m. D. Base = 900 m & Height = 1300m. Area of the field = Total cost/Rate = (333.18/24.68) hectares =13.5 hectares. Let altitude = x meters and base = 3x meters. Then, 1/2 *3x* x= 135000 or x^2 = 9000 or x= 300. Therefore, base =900 m & altitude = 300m. 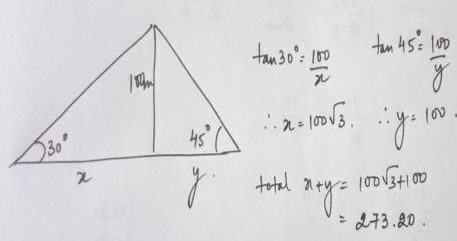 (20)^2 =(12)^2+x^2 or x=? (20)^2-(12)^2 =?256=16 cm. So, other diagonal = 32 cm. 8. On the two sides of a road are two tall buildings exactly opposite to each other. The height of the taller building is 60 m. If the angle of elevation from the top of the smaller building to the top of the taller one is 30° and the angle of depression from top of the taller building to the foot of the smaller one is 30°, then find the height of the smaller building. Let AB be the taller building of height 60m and CD be the smaller one of height h m.
9. Satish was looking at a new building Kohli Towers constructed having height of 200 m. The angle of elevation of the top of building from a point on ground is 30°. What is the distance of the point from the foot of the building? 10. Jaya Towers and Karuna towers are two tall buildings standing 400 metres apart. Two fast flying birds were sitting on top of these two towers and were aiming at catching the grains put up in one place. Jaya Tower's height is 300 metres and the grains 160 metres apart from Jaya Towers. Both the birds were flying down at the same speed and reached the grains spot at the same time. What is the approximate height of Karuna Towers?